If you spend your days toddling around the city with a toddler, the Upper West Side is a perfect place to let them explore. Sandwiched between two amazing parks are tons of places to enjoy with your little ones in this neighborhood that may just be as family-friendly as they come in NYC. I’ve been touring the Upper West Side with my one-and-a-half-year old 10 fun-filled blocks at a time and sharing my recommended itineraries for parents and toddlers. We’ve already tackled the 60s and 70s, so this time we’re toddling our way through the West 80s. It seems everywhere you turn there is something fun for families in this corner of the city, but these are our top 10 finds starting south and walking north. Hit this corner shop for free entertainment for your toddler while you pick up some items on your shopping list. Downstairs you’ll find a mix of groceries and drug store items including a massive wall of sippy cups and other toddler gear. But climb the stairs for the real jackpot - a fab toy section with a table of trains and tracks put out for little ones to play with. Heads up, there is no elevator for strollers. This newly renovated library reopened this year with the first floor dedicated to children. Head to the back to park your stroller, then let your little one explore the open area with board books, children’s DVDs and tot-sized tables. 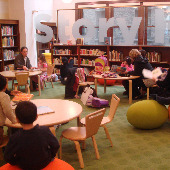 Weekly story times in the reading room are limited to 25 toddlers and usually have a line to get in. Check the online calendar for the schedule. This is a sunny ,neighborhood restaurant with a relaxed family-friendly vibe. There is plenty of room for strollers and a little nook at the front window seat with toys and books to keep toddlers entertained while parents order the family some dosas (crepes with yummy fillings and, of course, chutney). You could spend all day playground hopping in this neighborhood but this is our favorite in West 80s, especially in the summer when water flows through the winding “river” that runs through the park. We bring a toy boat and follow it downstream. There is also a cool sandbox, tons of swings and climbing bars and bathrooms! It’s wildly popular and wildly crowded, but no toddler tour of the UWS would be complete without this multi-level play space. 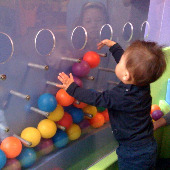 Let the kids climb, build and play with the cool exhibits and toys here and leave the mess behind. Go to CMOM’s website and view the online calendar for story and art times included with admission. In the summer bring along water wear to visit City Splash. What makes this cute children’s shop noteworthy is that 100% of profits go to The Children’s Aid Society. The store also provides employment and retail training to teens from Children’s Aid programs. If you pop in to support the cause you’ll find a nice selection of clothing, toys and books to choose from. Pop into this spacious, friendly shop to spy creatures you don’t usually spot on the Upper West Side. Step to the back of the store to see (and hear) brightly colored birds of all sizes. There is a cool reptile room and aquariums of fish to check out as well. This pleasant little garden is a fun find for toddlers. 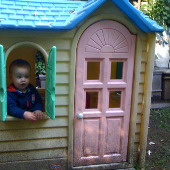 Follow the little paths through the greenery to discover a playhouse in the back. Bring along a picnic or snack to enjoy at one of the umbrella-covered tables or relax in a reclining chair while your toddler explores. If your toddler loves going up and down steps, this landmark will be a dream come true. After all that climbing check out the two cannons nearby. The history of the shrine and the gorgeous view of the Hudson River may be lost on your little one, but adults will enjoy! Toddlers can wander round and round the tiers of circular paths and down the stairs to the center of this flower-filled garden. The garden has an amazing tulip festival in the spring, and family-friendly performances in the summer. Check the website for more information on events. 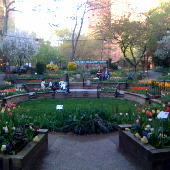 There is also a little playground on the 90th street side just west of the garden entrance. Did your favorite spot make our list? These are just a few favorite places to go with toddlers on the West 80s blocks of the Upper West Side. If you have other suggestions, share them with us below. Next time our neighborhood tour will continue as we head north and toddle through the West 90s. Also check out our top 10 places to toddle in the West 60s and West 70s blocks.